Alabama, Arkansas, Florida, Georgia, Kentucky, Louisiana, Mississippi, North Carolina, South Carolina, Tennessee, Virginia and West Virginia makeup the southern U.S. states. Out of all 12 states, south Florida, which falls within USDA hardiness zone 10, is the only area that can sustain the healthy growth of olive trees. Olive trees thrive in the well-drained soils of USDA hardiness zones 10 and 11. If you want to grow olive trees in the south, and you live outside of south Florida, you will need to grow your olive trees in containers. Fill a seed starter tray with sterile potting soil. Press one olive tree seed, ¼ inch down into the soil of each cell. Mist the soil with a spray bottle of water to dampen. Place the plastic cover on the seed starter tray and set the tray in an area that receives bright, indirect sunlight. Maintain a temperature of 80 degrees F.
Remove the plastic cover from the seed tray when the olive seeds sprout. Germination can take up to nine months. During this time keep the soil moist and maintain the light and temperature requirements. 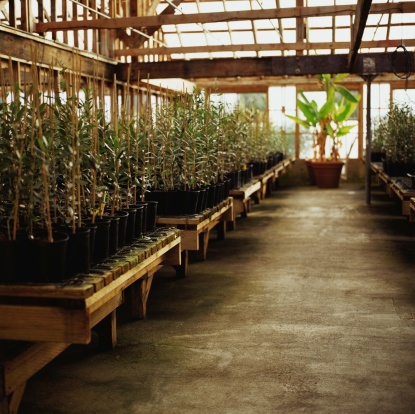 Transplant the olive tree seedlings in 4-inch pots when they develop their second set of leaves. Maintain moist soil, bright light and temperature conditions during the growth process. Prepare the soil for outdoor planting, if you live in south Florida, by breaking up large chunks of earth with a garden fork and testing the pH of the soil with a soil testing kit. Olives prefer to grow in well-drained, sunny soil with a pH between 5.0 and 8.5. The soil pH in south Florida varies. If your soil does not meet the required conditions, you will need to amend it. Add lime to the soil if the results of the soil test reveal a pH below 5.0. Amend with peat moss if the pH of your soil is above 8.5. Add either of the required amendments according to manufacturer's instructions. Plant the olive tree seedlings in the direct center of holes that match the size of their root balls. Space the holes approximately 20 feet apart. Backfill the holes after planting. Soak the soil at a depth of 4 inches after planting. Use a soaker hose that will provide deep watering. Allow the top layer of soil to dry out in between waterings, maintaining moist soil at a depth of 4 inches at all times. Olive trees will only require supplemental watering during droughts once they are established. Apply a 3-inch layer of mulch around the olive trees. A layer of straw or bark chips will help reduce weed growth and promote good drainage. Spread the mulch at least 6 inches from the wood of the olive trees to reduce pest infestations. Apply a nitrogen-based fertilizer to the soil around the olive trees after the first growing season. Apply the fertilizer per label instructions. Transfer the olive tree seeds to larger pots once they outgrow the 4-inch containers. You will know it is time to change pots when the soil dries out quickly in between waterings, or when the roots begin to grow out of the drainage holes. Feed the olive trees a diet of nitrogen-based fertilizer, applying the fertilizer according to manufacturer's instructions. Keep the olive tree plants well watered, allowing the soil to dry out in between waterings. Keep the container grown olive trees in an area that receives bright light, maintaining a temperature of approximately 75 degrees F or above. In the south, you can place the containers on your balcony or patio. Just make sure that you bring the containers indoors when the temperatures drop below 30 degrees F.